Hello friends! It's Lee-Anne here and I was wanting to share a layout I created for Spring. It's actually going to be framed and hung on my wall to celebrate Spring each year. For this layout, I added the yellow flair button from the Watercolor Circle Flair Set. I thought it would be perfect to dot the "i" to add to the word "smile". I used my sketch pens in my Silhouette Cameo as a template and with some embroidery floss, I hand stitched the daffodils design and when I was finished stitching, I used a water brush and watercolored inside the hand stitching with some distress oxides. This was a labor of love, but I am happy how it turned out. Hand stitching to me is very relaxing. Thanks for stopping by and be sure to check out the shop for these flair buttons and hundreds more. My mouth starts to water when I even think about sushi! It's so good! But that wasn't always the case as I was really struggling with the first plate of sushi I ever ate! But after that I wanted to give them another chance, chose totally different kind of sushis and it was easier. Then another try, I liked them and now I'm at the point of "sushi love" like the title of the page says! I chose the color palette to match salmon sushi - peachy salmon color, orange and black. There's also a hint of wasabi green and a sushi patterned teal paper. Naturally some Sushi flairs needed to be included as decoration and they kind of sparked the whole page and colors, too. I also added a couple of more flairs from different sets, Rainy, Fruit Slices and Texture 1. All of them compliment the color scheme. I especially love the Texture 1 set as the flairs are so grungy! Are you a sushi lover, too? If so, what's your favorite one? Thank you for stopping by today! A new way to use flair buttons....Needle-minders! I have seen my flair used as embellishments on paper projects, hair bows, gifts, bags, hats, but a genius idea by The Primitive Stitcher on You Tube blew me away. She uses them as "needle minders". I had no idea what that meant but after I watched her You Tube video I had an "a-ha" moment. How stinking cute are these!? Check out her video to see. I have such creative customers! Please feel free to send me photos or videos on how you use A Flair for Buttons flair I would love to see them! Thank you for sharing this amazing idea with me and others. I do love a good challenge. Paper Issues has a Take 5 challenge that I am playing along with and added the best flair to top it off! For my girlie layout, I used Maggie Holmes Carousel collection by Crate Paper. There were so many pieces of flair that I could have added but I narrowed it down to three and added them to the center of the flowers for effect. I used Best Friend Flair, Inspirational Words 7 and My Life Words 2. Today I am playing along with the Take 5 Challenge over at Paper Issues, and adding some of the best flair. For the challenge, you must pick at least 5 from a given list. I used Crate Paper's Carousel Collection by Maggie Holmes. I used Best Friends Flair, Inspirational Words 7 and My Life Words 2. Hey everyone, Michelle here today with a new LO to share. I recently bought myself a pair of fringe scissors. I wasn't really sure what to do with them so they had just been sitting on my desk for a while. So I just decided to go for it. No LO plan, just me and my scissors. This ended up being one of the fasted LO's I've ever made. Once I had the strips cut out all that was left was a little fussy cutting and embellishing. I used a variety of Dear Lizzy papers. This title is so perfect for my daughter. This girl shows no fear. Plays hockey in a boy's league, always willing to try anything, and never afraid to just be herself! These yellow flair buttons were just the perfect shade for my LO! Heart ones are my favorite! I had a ton of fun making this layout! I also made a process video, if that suits your fancy! I used flair from three different flair sets: Just Hearts 2 Flair set, Watercolors Flair set, and Take a Picture 1 Flair set. Thanks so much for stopping by! XO o.g. Hello AFFB fans! It's Lee-Anne here today sharing a layout of my dear daughter in law Lori who is expecting her first child (my first grandchild) in July. It's an exciting time for my family. and the orange watercolor flair button is from the Pastel Circle Flair Set. I loved creating this layout and when it was time to add some embellishments, I dug into my flair buttons and decided on some flair buttons that represented my daughter in law being brave because she is remarkably brave after having past pregnancy issues over the past few years and I thought the orange circle flair button coordinated well with the layout. Sometimes random flair buttons go well with any theme. Thanks for stopping by and be sure to check out the A Flair For Buttons shop for all your flair button needs. There is something for everyone. Hey everyone, Michelle here today with a new LO to share. I did this LO a few weeks ago at a crop and it was just one of those LO's that came together really fast. I actually had my LO done and I felt like it was missing something. I realized I hadn't added any flair buttons! Shocker! I always use flair! So I dug through my stash and found this perfect color button from the Just Hearts 2 set! Hi everyone, Laurel here with another quick and easy card to share. I have used the New Coffee 1 set. I love everything coffee... except the taste! LOL I'm a tea drinker myself but I do like to create coffee themed projects for my friends. I stamped some of the pieces of the background paper but much of it is from SU! The cup is a SU! die. I thought the New Coffee 1 flair button worked well to finish off the cup. What do you think? Hey there! I have a fun project today using the Super Hero flair set! So Scooby Doo is like a right of passage for kids right? My son LOVED (and maybe still does) it. He had stuffed animals, blankets, books. You name it. When we went to Great American and he saw Scooby stuff all over he went nuts. He insisted on playing games so he could win more Scooby! He was so excited it was hard to say no. He carried him to the car just like that. Well, all it took was finding this photo to get things started. 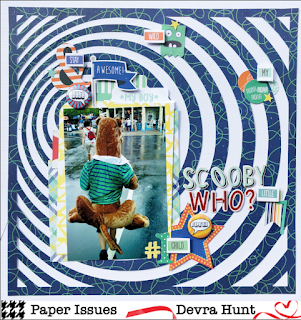 Scooby Doo and this cut file from Paper Issues go hand in hand! At least in my head they do. I got stuck on embellishing this page though. Even though the design is so busy, it felt too flat. Ahhhh, flair to the rescue. How cool is that Dude flair? It has a similar design to my page. It even has a 70's vibe going, kinda like Scooby Doo. Wait there's more! That Superkid flair too! Yes, my son was a super kid that day for desperately wanting Dad to win him Big Scooby! I couldn't have asked for more. The colors and sentiments are spot on. Hiya there! It's Riikka here today to share a layout with you. The topic this time was inspired by one of the new flair sets - the Sloth Love. The moment I saw those I knew I had to do a page about my older daughter! She was so excited about sloths after visiting the local zoo with school and learning that the oldest sloth alive, Coco, (in a zoo) is in Finland. We needed to visit the zoo a couple of times just to check how Coco was doing. Like always, I started the page with mediums, but wanted to do a bit differently this time. So I first added gesso, like I often do, but then added some die cut clouds on top. The enhance the dreamy feel I added also some Zs in there turning a foam alphabet letter into a stamp and then finished the background with pastel splashes on the colors of the flair buttons I had chosen to use. Naturally I also needed to stamp that cute sloth in there, goes with the topic! I took a picture before continuing, just showing the background layers if you want to study them. I then added the paper layers and embellished the page. The first button to be included was naturally from the Sloth Love set. I also added a cloud patterned one from Sunny as it fitted the clouds I added as die cuts to the background. Some hearts were in order, too, as the page is about love. The pale blue ones are from Pastel Heart Bokeh set. Thank you for stopping by today! Wishing you a sweet and dreamy day! Hi Friends. Happy May! One of the challenges that the Paper Issues DT participated in over the weekend was "Name That Tune". Use a song title or song lyrics on a page. I married Norah Jones' "Come Away With Me", and the newest Crate Paper collection "Here & There". The photo I wanted to use was taken on one of our anniversary trips to Miami. What a serene location. The collection was perfect for it, and I didn't hesitate to add a cute flair from A Flair For Buttons from "My Life Words 1". I built the layout in the center of the page, to give me room for the long and large title. I didn't realize that the rose gold glitter thickers had a multi-use to them. Meaning I could either use the outline of the thicker or the inside of the thicker. Both options. Or I can decide to leave the two pieces together. I thought it would be fun to put the outlined rose gold glitter thickers over some patterned paper and place them neatly in a row. In the photo below, I rotated the layout to show how the same elements can create an entirely different page. This page came together quickly; I just honestly had fun with it. I hope you will visit the A Flair For Buttons Facebook page for more inspiration, as well as their IG account. Stay tuned for more AFFB projects this month, from the rest of the amazing DT! P.S. If you've never heard of the song... check it out here. Custom Flair Buttons at my Etsy Shop!